The network is scale-free, suggesting that there are large hubs. Interestingly, the assortitivity is negative, suggesting a network more like an internet-like network than a social network. However, these statistics may be affected by the fact that the data is from an English perspective. Although I’d have to quantify this more carefully, it looks like the algorithm has classified the nodes so that the red ones are Germanic languages (Norse, German, Old high German etc.) and the green ones are Romance languages (Latin, Italian, French). 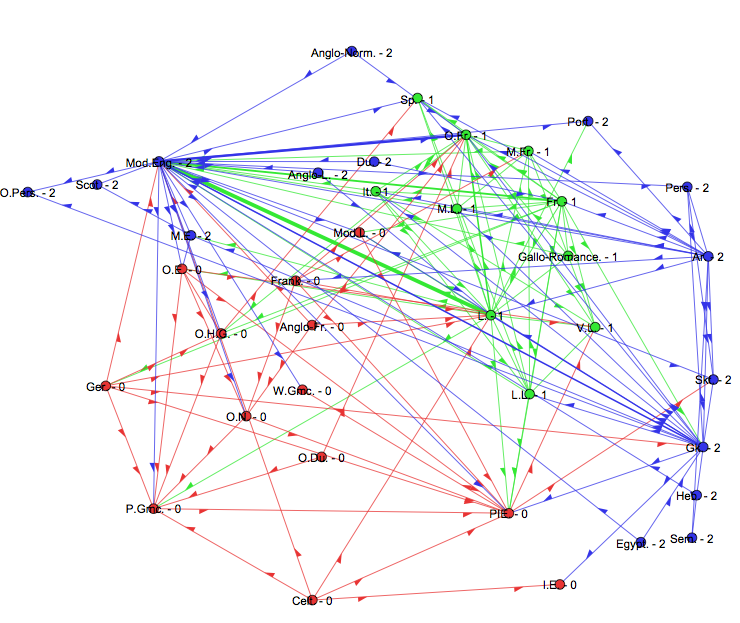 The blue nodes look like an ‘other’ class, but also have some features in common – Egyptian, Sanskrit, Persian, Arabic. However, there are clear odd-ones-out: Celtic being Germanic, for example. Actually, the algorithm is non-deterministic, so this is just one of the categorisations it found. I’m going to have to go back and do this analysis properly and check the quality of the original data. Adding etymology data from another language would be good, too. As a side note, I’ve also been learning how to do phylogenetic analyses using SplitsTree and Neighbour Net. I thought I’d do a little experiment: Construct a graph of past and present languages, with the distance measure being the number of words borrowed from one language to another. Actually, I can’t make any sense of this at all. I suspect that the data is too sparse. If I was to make a grand conclusion, it might be that some parts of the inheritance of English is tree-like and some is graph-like, and this might vary over time. This might affect the assumptions you can make about cultural inheritance. Still, there’s some evidence of network-like structure there. And it looks pretty.